I thought I’d posted these photos already, but I can’t seem to find where I did it, so I must have just thought about posting them rather than actually posting them. 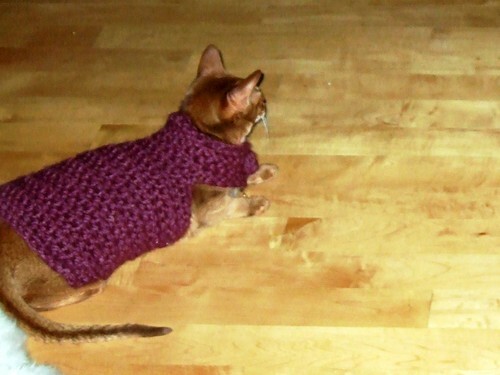 One of the presents I gave Jacoby and Angel for Christmas were Sphynx Sweaters. 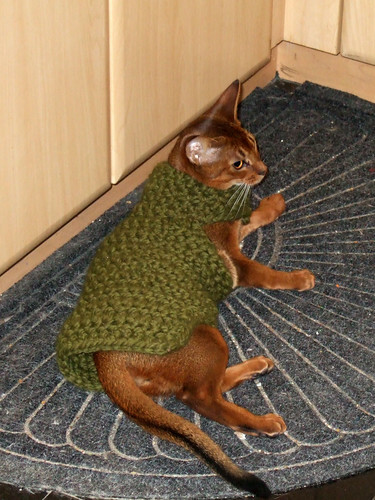 Of all the cats I’ve known, the Abys (all three of them: Gun-Hee, Angel and Jake) were the only ones who not only would wear a jacket or sweater in cold weather, but actually keep it on. It’s like they know that I’m putting clothes on them because it’s cold outside, and they’re warm weather cats (Gun-Hee would shiver in anything below 60°F). Jake’s sweater is a nice grassy green. Angel’s is a robust burgundy.